"If you work for a company that might be curious, poing your Human Resources team to www.SuperBetterAtWork.com to chick it out and request a demo." You can made something like Facebook does, where community is allowed to translate the game into their own languages. There is people around the world who doesn't understand English very well, but they would enjoy this game. On "Shrug It Off," it mentions "stress-busing moves." It is supposed to be "busting"? It says "Any time you (even slightly) enjoy being afraid or anxious by adding breath or imagining a positive outcome"
I think it's missing a few words. I can't even quite piece together what it was meant to say, although I can grok the meaning. Maybe, "Any time =fear affects something= you (even slightly) enjoy, =reduce your level of= being afraid or anxious by adding =an extra= breath or imagining a positive outcome." Stress often bubbles up as a response to something that isn’t working ** our lives. Which leads to a 404. 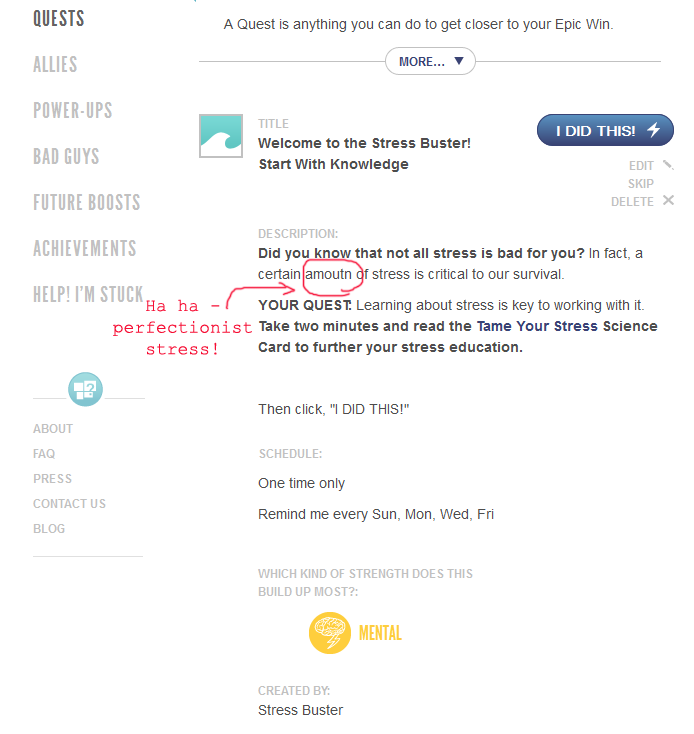 >Your* break the cycle of aggression, through the sheer power of your mind (watch out, X-Men). "Welcome to the Gratitude Power Pack"
It's not exactly a grammatical problem, but it's the closest match. The text reads, "Every day you get SuperBetter, you're having a positive impact on six people you know personally. They each pass on your strength to six people they know, and then they each pass it on to six more people they know. That's 256 people in total!" And that's not counting you! So add one more and you have 259. Small math error, yes. But when a program has its roots in science, it's good to get the arithmetic right. Apologies for the nitpick, but I figured somebody might want to fix that. 1. I very much appreciate that you provided accessible video transcripts. I realize lots of people like videos, but I find them annoying. I was much happier reading the information than hearing it. 2. I noticed that you guys were using American spelling but British punctuation conventions. You should pick just one variation of English. In American English, periods and commas go inside the closing quotation marks, "like this." Using correct English will make your site seem professional and trustworthy. I realize you use lots of slang and neologisms, but if you do so without any flat-out mistakes, it will establish that your tone not the result of ignorance or sloppiness but rather a deliberate choice. Word missing from description of Pervasio Universio bad guy. This Bad Guy tries to convince you that every setback universal implications—that is, every small problem is a symptom of something larger." It seems the word "has" should go between "every setback" and "universal implications". "YOUR QUEST: As yourself the first magic question. " I can assist with grammatical knowledge if you would like! Okay, so, I have been using Superbetter for about 2-3 weeks. Throughout my regular use of this program, I have noticed various degrees of grammatical errors that are usually the result of quick typing (they happen to everyone, even myself). Unfortunately, the human mind reads them correctly, so they are often hard to catch unless you are trained or have practiced doing so. Some people (again, like myself) catch these grammar errors. Upon seeing these grammar errors, I make no judgments about the website and place no blame; however, I would like to offer my assistance in correcting these errors. If you would like, I can compile a list of grammar errors that I notice at first glance, and maybe a few that require a bit of research and practice. I will be able to send them easily through e-mail, so I do not require access to your website or anything wacky like that. There is no weird or hidden tricks, I am just interested in grammar and saw my chance with your website. Okay, before this e-mail gets too long-winded, off it goes so that I can see what you think on the subject. Please send me an e-mail back regardless of your answer, as I will be eagerly awaiting your reply! "Wiggle two parts of your body that you don’t normally go together"
Should that be "that don't normally go together"? Picky I know, but I thought I'd mention it! Letting the Awesome Out: Take a Risk, Part I. Last sentence says "Doing a physical location..."